It’s Fall now, which means pumpkins, apples, pears, and all sorts of spices that make you want to wrap up in a blanket sipping a warm drink as you watch the season change outside your frosted window. Ok, actually that doesn’t really happen here in Las Vegas. But it’s raining in the desert which means having something close to what I described above. It also means needing some dee-lish comfort food. This is one of my favorite recipes. After I got it from my sister, Amy, a couple of years ago, I made it practically every other Sunday night. Last night I demoed them for the ladies at church. They were a hit! Enjoy it! In a large bowl, combine flour, sugar, cornstarch, baking powder, cinnamon, salt, ginger and nutmeg. In a medium bowl, combine egg yolks, milk and pumpkin; mix well. Add to flour mixture. Stir in butter. In a small mixer bowl with an electric mixer, beat egg whites until soft peaks form. Gently fold into pumpkin mixture. Preheat waffle iron according to manufacturer’s directions. 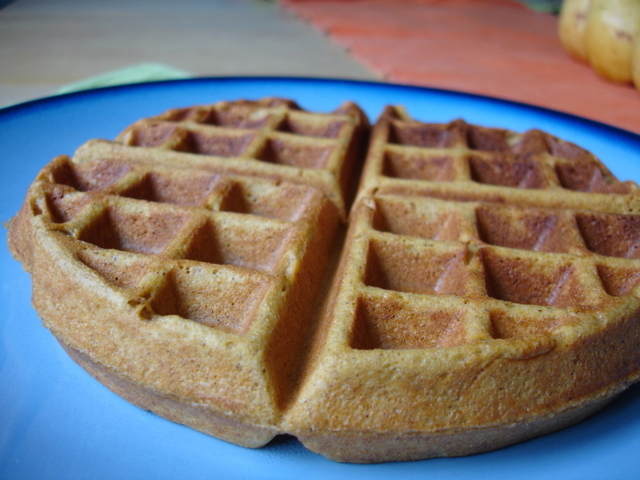 Depending on size of waffle iron, pour 1/2 cup to 1 1/2 cups batter onto hot iron. Generously sprinkle with nuts (or maybe chocolate chips?). Bake in iron according to manufacturer’s directions. Serve with Pumpkin Maple Sauce. Makes 6 to 8 waffles. Pumpkin Maple Sauce: In a small saucepan, heat 1/14 cups canned pumpkin, 1 cup maple syrup and 1/4 tsp ground cinnamon until warm. I also like to sometimes top it with whipped cream and then it’s like pumpkin pie…… but in a WAFFLE! If you’re a breakfast girl like me, it doesn’t get any better. If sharing food equals love, then just know that my sharing this with you means that I have a huge crush on you. This entry was posted on October 20, 2010 by mamacheetah. It was filed under Autumn, domestic diva, Food . I’m gonna make these tomorrow – can’t wait! Hey, we made those last week, 1 out of 4 of my kids liked ’em. I thought they were fab and freezed the extras.